Editor’s note: This story is courtesy of the Patriot League and New Hampshire athletics. DURHAM, N.H. — Patriot League champion Colgate built a 21-point fourth-quarter lead and held on in the final minutes for a 27-20 win at New Hampshire in the first round of the NCAA Division I Football Championship on Saturday at Cowell Stadium. The Raiders (8-4) advance to face No. 5 seed James Madison in the second round next Saturday at 1 p.m. on ESPN3. Colgate earned its first FCS playoff win since 2003, when the Raiders won three games to become the only Patriot League team to advance to the national title game. Colgate took control early in the fourth quarter when James Holland scored from two yards out for his fourth touchdown of the day and a 27-6 lead with 12:16 to play. The touchdown completed a 17-play, 81-yard drive that spanned 10:27 and came one drive after Holland had scored from one yard out to make it 20-6 with 9:59 left in the third quarter to complete a 10-play, 77-yard march. Colgate controlled the ball for 12:44 of the third quarter as well as the first 2:44 of the fourth quarter to take the three-touchdown lead. New Hampshire (7-5) would not go away, scoring on a touchdown pass with 9:39 left and a scoring run with 5:30 to go to cut the Colgate lead to 27-20. The Raiders turned it over on their next possession as UNH took over at the Colgate 43 with 4:29 to play, but the defense came up big to preserve the lead. Tyler Castillo picked off a pass on a deflection and returned it to the Colgate 40 to give the Raiders the ball back with 3:39 to go. Colgate then picked up a critical first down when Jake Melville tossed a screen pass to Demetrius Russell for an 11-yard gain on a third-and-six play when New Hampshire had no timeouts remaining. 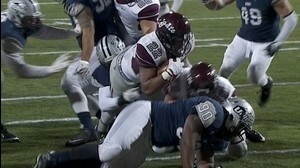 The Raiders held the ball until pinning UNH on its own 17 on a punt with 29 seconds to play, and Colgate would only allow the Wildcats to get 19 yards from there as it held on for the win. The Raiders never trailed in the game. Holland scored his first touchdown of the day from six yards out for a 6-0 lead at 9:23 of the first quarter, then answered a UNH field goal with a one-yard score at 9:29 of the second quarter for a 12-3 lead. Colgate took a 12-6 lead into the half as the Raiders held UNH to a pair of field goals on two trips inside the 10 yard line. Holland carried 23 times for 95 yards and a career-high four touchdowns for the Raiders, becoming the first Patriot League player to rush for four scores in a postseason contest. Melville completed 12-of-17 passes for 188 yards and also carried 15 times for 66 yards in the game. Kyle Diener led the Raider defense with 10 tackles, while Chris Morgan had eight tackles, 1.5 tackles for loss and a fumble recovery. Castillo had a fumble recovery as UNH attempted a lateral on the final play in addition to his key interception. Colgate was narrowly outgained 399-377, but the Raiders controlled the ball for 33:17 and cashed in with touchdowns on all four of their trips in the red zone. Colgate’s victory marked the third-straight season where a Patriot League team has won a first-round contest in the FCS playoffs after Fordham beat Sacred Heart at home in each of the past two years. The victory is also the fifth in the last six postseason years for Patriot League squads, with Lehigh winning a first-round game at Northern Iowa in 2010 and a second-round contest at Towson in 2011. Colgate’s win over New Hampshire is the first postseason victory for the Patriot League against the Colonial Athletic Association since the Lehigh win over Towson. Senior quarterback Sean Goldrich directed a fierce fourth-quarter rally, but it was not enough and the UNH football team came up just short. UNH ended its final season in Cowell Stadium with a 7-5 overall record. The Wildcats were playing in the FCS tournament for the 12th straight season, which is the longest such streak in the nation. Holland’s fourth touchdown came at the end of a 17-play, 81-yard march that lasted 10 minutes, 27 seconds. UNH answered with a 10-play drive that covered 74 yards in just 2:30. Goldrich connected with redshirt freshman Rory Donovan (Canton, Mass.) for a 12-yard scoring pass with 9:39 left for UNH’s first TD to cut the lead to 27-13. The Wildcat defense forced a punt and the offense struck again for a 10-play, 90-yard drive. On fourth and two from the Colgate 18, Goldrich, looking only for the first down, got to the right sideline and ran in for the score. Junior Morgan Ellman (Scotch Plains, N.J.) kicked the conversion and it was 27-20 with 5:30 left to go. Three plays later, UNH got the ball back when senior Dougie Moss forced a Holland fumble and junior defensive end Cam Shorey recovered it with 4:29 to play. But on UNH’s fourth play, on first and 10 from the Colgate 39-yard line, a Goldrich pass got deflected and Tyler Castillo intercepted it to end the threat. Goldrich finished with a career-high 41 completions on a career-high 56 attempts for a season-high 309 yards. Colgate avenged a 26-8 loss to UNH in the second game of the season in Hamilton, N.Y.
McDonnell talked all week about how much Colgate had improved since that game and the Raiders went out and proved it. UNH had 218 yards rushing in the first game and just 90 yards rushing on Saturday. The Wildcats had 399 yards of total offense to Colgate’s 377. They also turned the ball over three times – once on a desperation last play of the game – to Colgate’s once. UNH junior wide receiver Kyon Taylor caught 11 passes for 128 yards and senior wide receiver Jared Allison grabbed 14 for 83 yards. Holland and junior quarterback Jake Melville, in particular, caused problems for the UNH defense. Melville completed 12 of his 17 passes for 188 yards. He has now attempted 197 passes since his last interception and has been intercepted once in his last 344 attempts. He also ran 15 times for 66 yards. Holland had 23 carries for 95 yards and the Raiders balanced their offense with 189 yards rushing and 188 passing. A pair of Holland scores staked the Raiders to a 12-6 halftime lead. He scored on a 6-yard run after UNH fumbled the ball away on its first possession and scored on a 1-yard run with 9:29 left in the second period. Jonah Bowman’s first conversion kick was wide and his second was blocked. Ellman did UNH’s first-half scoring with a 23-yard field goal seven seconds into the second period and a 22-yarder with 1:10 to go in the period. Junior linebacker Ryan Farrell and redshirt freshman defensive end Jae’Wuan Horton (Stafford, Va.) led UNH with seven tackles each. The Raiders are riding a six-game win streak into James Madison. They won the Patriot League with a 6-0 record. The Wildcats were 3-4 after a loss at Delaware on Oct. 24 and won their last four regular season games to keep their playoff streak alive. Their next home game is Sept. 10, 2016, when they open the new Wildcat Stadium – now under construction – with a game against Holy Cross.